If state Sen. Steve Russell believes that allowing concealed weapons on campus will protect our state’s college students and faculty, then he should push for the same at the State Capitol building. 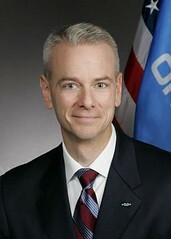 Russell, R-Oklahoma City, pictured right, has introduced Senate Bill 858, which would allow students and faculty members with an appropriate gun permit to carry concealed weapons on any of Oklahoma’s college campuses, except for access-controlled events deemed gun-free by a college president. Supposedly, the measure is to protect students and faculty in light of massive shootings like the one at Virginia Tech in 2007. Under this frame of reference (or frame of “fantasy”), sharpshooting students or professors could take down shooters before they can do any or much damage, thus creating a safer environment. But if that were true, why wouldn’t Russell and those who support his legislation push to open up the State Capitol building to concealed weapons as well? Right now, firearms are not allowed at the building, according to Oklahoma’s Department of Central Services. Why not? Russell and others may argue that doesn’t need to happen because people are screened as they go into the State Capitol building-state Rep. Sally Kern (R-Oklahoma City) got caught carrying a gun into the building a couple of years ago-but if that’s the counter-argument, then why not just screen at colleges, too? Russell’s legislation creates a clear double standard. If weapons in college classrooms are going to be allowed and even encouraged by this legislation, then they should also be allowed and encouraged at the State Capitol, including in the offices of state legislators. If the argument is the cost of screening at colleges is prohibitive, then let’s cut screening at the State Capitol and elsewhere to save money and go to the concealed weapon strategy. If the cost isn’t prohibitive, then let’s screen at colleges. Does Russell believe access screening creates a safer environment than allowing everyone to carry guns? If so, then he needs to tell us what it is exactly that makes he and his fellow legislators more important than professors and students. If not, then everyone should be allowed to carry guns at the State Capitol because that’s the safest policy. Here’s a list of items currently not allowed at the State Capitol building. Why can’t colleges use this same reasonable list, which prohibits firearms and ammunition? That’s just a small, overview list. Here are some specific situations: What about students who let professors know in direct or indirect terms they are carrying a concealed weapon and then ask to speak privately about a poor grade on a paper or test? In these cases, can professors ask for security protection from campus police without repercussions? What if a student opens a backpack and a gun falls out? Can a professor ask the student to leave the class and report them to the administration or campus police? What if non-packing students in a specific classroom feel threatened and intimidated by students who tell them or even brag openly they have a weapon and they complain to the professor? Can the professor report the situation to the administration or campus police? Russell has also introduced an “open carry” bill that would allow people to walk around openly with their weapons in holsters so we can be like the wild, wild west here. This legislation seems like a shoo-in because Gov. Mary Fallin has indicated in the past she supports the idea. A similar bill passed the legislature last year, but former Gov. Brad Henry vetoed it. But will Fallin support “carry on campus”? If she does, then she should allow constituents to carry concealed weapons in her office as well. After all, it’s about safety, right? How many people must die from guns? Mr. Russell how would you feel if one of your children was shot and died because on your actions? We should have progressed from the wild west days where carrying a gun was appropriate. Why should we now? Violent crimes is down, the police won’t know who is a threat, and your law will encourage more, not fewer, deaths. Enough is enough, and before you write me off as a bleeding heart, I have used guns and served in the Navy during the Vietnam War. Just like the drivers we all complain about, those same folks will now be armed. That is a prescription for mayhem and death. Their deaths will be on your head, hope he can live with it.